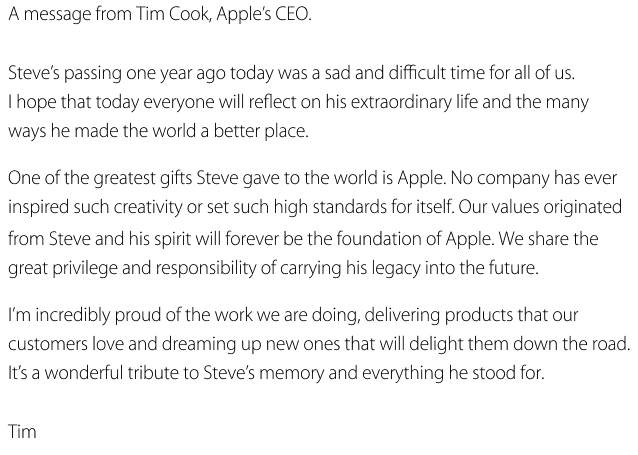 Apple’s CEO Tim Cook remembered the company’s late cofounder, Steve Jobs on the one-year anniversary of Jobs’ passing. The letter with a video montage appeared on Apple’s website to remember his life and death. The nearly two-minute video presents a slideshow of Jobs throughout his career and it softly ends with “Remembering Steve”. Jobs died on Oct. 4, 2011. After he passed, at just 56 years old, news of his death flooded the Internet, TV, newspapers, and homes. Millions of people immediately emailed Apple, and the company subsequently created a “Remembering Steve” page to display a massive compilation of condolences that poured in from around the world.